After a snowy weekend last week, we had a mild weekend this past week and today I was wearing shorts and flip flops. It was delicious. Tonight the moon is full and the frogs and toads are performing a symphony in our front yard. Click on the video to hear the chorus. That will change tomorrow. Back to cold weather and rain. The frogs will go back to sleep for a while. I have managed to make a few new pieces from the items that I bought at the flea market. Here are some of the creations. 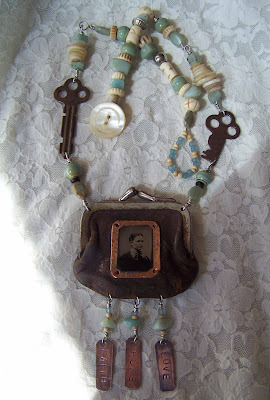 Inside the purse are little pieces of history. 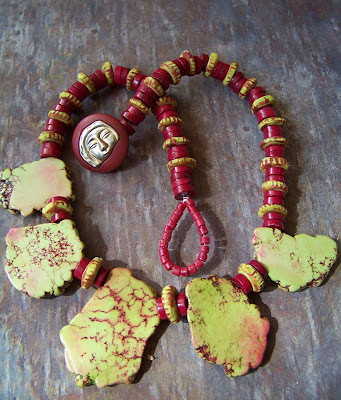 This necklace is color enhanced turquoise and coral with polymer clay beads. 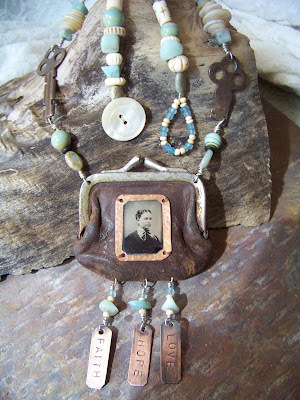 My jewelry will be at Silo Studio this Thursday for the monthly Studio Thursday show. If you are local and have the time, check it out. Shawn has been her usual creative self and there will be lots of her fun furniture and accessories for sale also. Love the frogs song ! The necklaces are great, can’t pick a favorite! I’ve been making a lot of jewelry for a coming show but still have to take some photos! Did you make the polymer clay beads? Thanks! I did make the polymer clay beads. 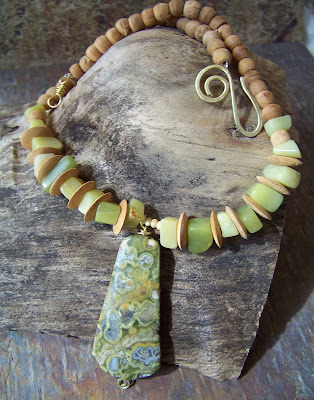 I couldn’t find any chartreuse beads to match the stones so I made some. I love the symphony! VEry very nice! 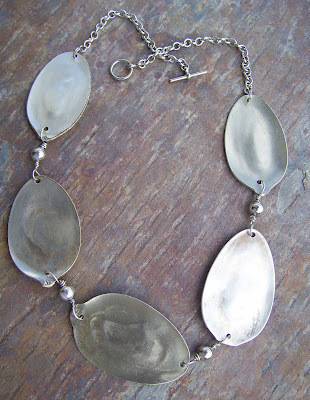 I also love the flattened spoon necklace, maybe you make one for Christmas for me. (hint) You know me, I love BIG necklaces.